This cake went along with the theme “Garden Girl Party” for a 3 year old. I wanted to make sure that it matched the invitation, and since the party was big, it allowed me to make a 12×18 inch yellow cake with homemade buttercream icing. All of the letters, number 3, flower and butterfly are made out of chocolate. I attached a lollipop stick to the back of the 3 with chocolate to make it stand up on the cake. 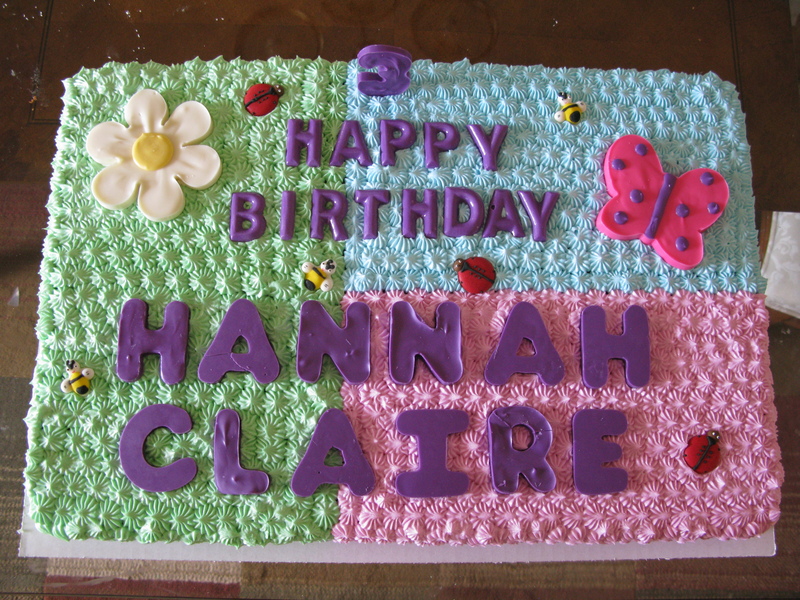 The bumblebees and ladybugs are royal icing that I purchased from a crafts store. I was overall pleased with how the cake turned out, with some minor adjustments for next time. What I learned: Not to use cookie cutters for the bigger letters. They weren’t smooth like the smaller letters I used a chocolate mold with. There were several wasted letters that cracked when trying to pop out of the cookie cutters when they had hardened. Next time, I’ll just use the letter cookie cutters for fondant.